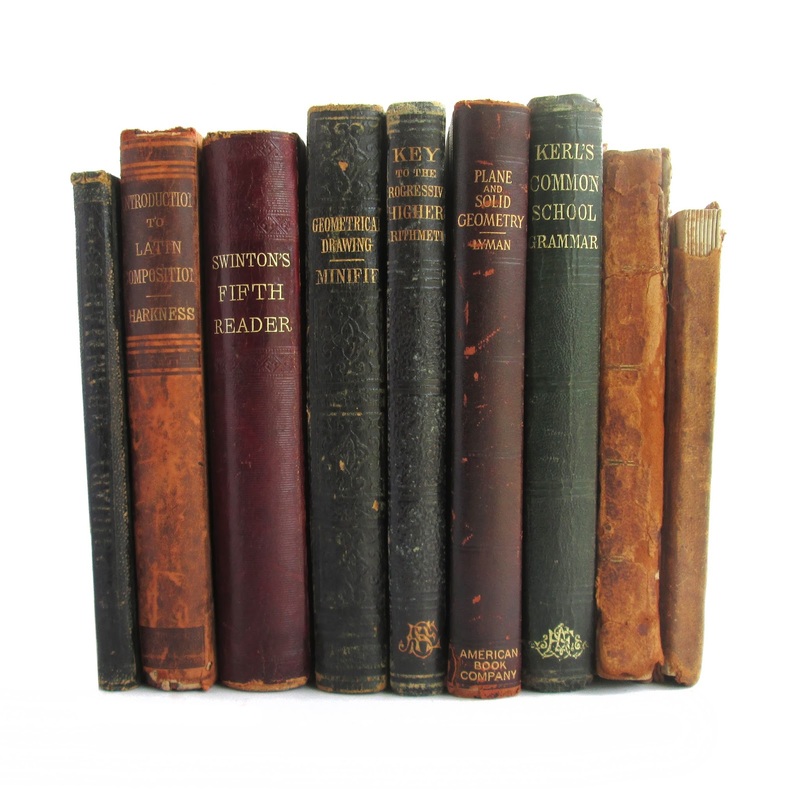 Collection of sixteen antique children's schoolbook readers and textbooks, most from the 1800s. 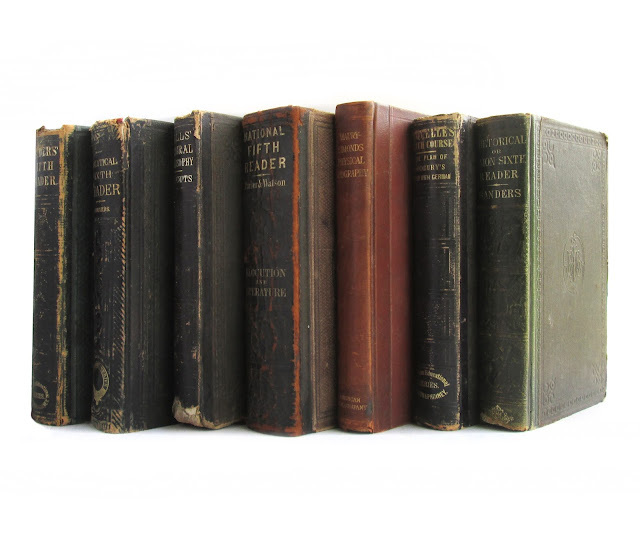 Books show a fair amount of wear and soil, bindings are loose in some volumes. All books feature a half leather binding. Detailed descriptions below. A TEXT BOOK OF GEOMETRICAL DRAWINGS ABRIDGED FROM THE OCTAVO EDITION Minifie, William D. Van Nostrand Good 1869 Half-Leather. 4th Edition. 4.5x7.5. 1/2 leather cover. This is a textbook of geometrical drawing with black and white illustrations and print. black cover gold lettering 160 + pages. Book is in good condition with edgewear, cover wear and soil, loosening binding with loosening pages, drawing on the front endpaper, wear and soil. KEY TO THE PROGRESSIVE HIGHER ARITHMETIC Various Ivison Blakeman Taylor and Company Fair 1874 4.5"x7.5". This hard cover book has a brown cover with gilt lettering on the spine of the cover. The cover is worn, there is a tear on the front end paper, edgewear, tanned pages, wear and soil. A book of mathematics for the teacher and private learner. 247 pages. THE AMERICAN INTELLECTUAL ARITHMETIC Stoddard, John F. Sheldon and Company Good 1860 4"x6". This hard cover book has a brown cover with black lettering on the front and leather spine. The cover is worn and there is foxing. The leather spine is chipped on both ends. The top right page corners are chewed. A book of arithmetic designed for the use of schools and academies. 171 pages. SANDERS' RHETORICAL Sanders, Charles w. Ivison Blakeman Taylor and Company Good 1862 This hard cover book has a brown cover with with gilt lettering on the spine of the cover. The edges are worn and the page ends are marbeled. Embracing a full exposition of the principles of rhetorical reading. 600 pages. THE SCHOOL READER FIFTH BOOK No Author Ivison Phinney Blakeman and Company Poor 1864 This hard cover book has a green cover with gilt lettering on the spine of the cover. The front and rear endpapers are gone, the inner hinge is cracked, owner's name and other markings on the front innerboard, waterstain to the page corners, corner wear, chipped spine and there is wear at the edges. 456 pages. A NEW METHOD OF LEARNING THE FRENCH LANGUAGE Fasquelle, Louis, LL.D. Ivison, Phinney & Co. Good 1860 This antique hardcover French-language textbook has a black cloth cover with black leather spine, gilt spine lettering. Edges and spine are worn, some foxing. A complete introduction to French, including vocabularly, pronunciation, verb conjugations, and more. 508 pages, including index, plus advertisements; approx. 6"x8". 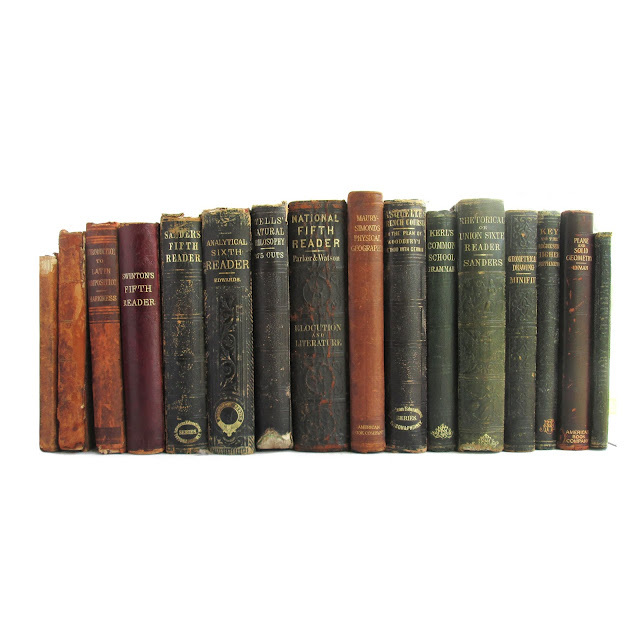 ANALYTICAL SERIES: ANALYTICAL SIXTH READER Edwards, Richard Taintor & Co. Fair 1867 This antique hardcover textbook has a black patterned cloth cover with black leather spine, bright gilt spine lettering, marbled page edges. Front endpaper excised, edgewear, soil and chipped spine. Inside pages clean, binding tight. Contains passages and exercises regarding proper usage, spelling, elocution, and grammar for early high-school age students. 494 pages; approx. 5"x8". SWINTON'S FIFTH READER AND SPEAKER Swinton Ivison, Blakeman, Taylor, and Company Good 1883 This antique hardcover reader has a homemade brown patterned cloth cover with no lettering which is sewn over the original boards. Some cover soil. Owner's name on front endpaper; discolored endpapers; soil; inner pages otherwise clean, binding tight. Contains pieces for reading and speaking. 479 pages; approx. 5"x7". Physical Geography Maury, M.F. American book Company Good 1916 6 x 8 hard cover book. Gold lettering on the brown spine with a plain brown cover. An old geography textbook. 347 pages. Some cover edgewear. Tight binding. Good condition. A Common-School Grammar of the English Language Kerl, Simon Ivison, Blakeman, Taylor & Co. Good 1872 5 x 7.5 leather spine hard cover book. Gold lettering on the black spine with a purple cover. An antiquarian grammar reference book. 354 pages. Leather spine. Some writing. Good condition. THE NEW YORK READER, NO. 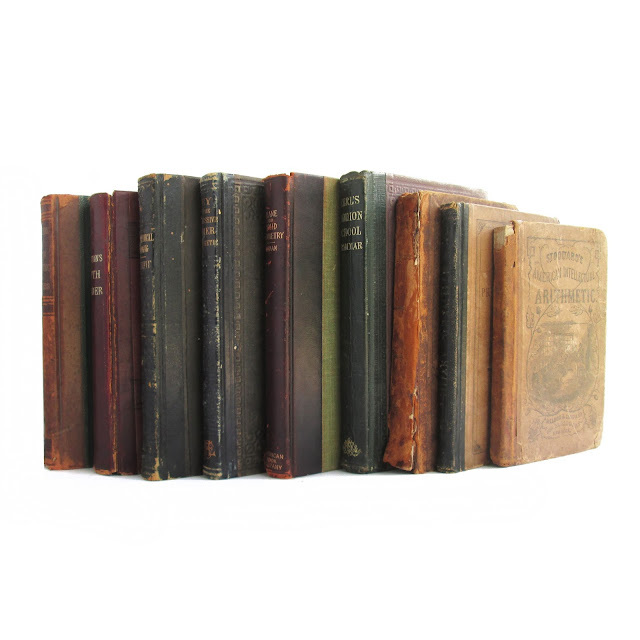 3 No Author Samuel Wood and Sons Fair 1816 This antique hardcover reader is bound in tan boards with a leather spine. Spine is worn, mended; covers are browned, spotted and worn. Inner pages are browned. Writing on endpapers. Foxing. Text on covers is faded. This is a school book for young readers, containing prose and poetry selections. 238 pages; approx. 4"x7". Pinneo's Revised and Enlarged Primary Grammer of the English Language Pinneo, T. S. Wilson, Hinkle & Co. Fair 1854 This 4.5 x 6.5 hardcover has 160 pages. Educational textbook of primary grammer of the English language for beginners. Cover wear, pencil marks and scribbles, foxing. Wells's Natural Philosophy Wells, David A. Ivison, Phinney, Blakeman and Co. Poor 1866 The latest results (as of 1866) of scientific discovery and research arranged with special reference to the practical application of physical science to the arts and the experiences of everyday life. Book is in poor condition with foxing, edgewear, bottom covers and spine end chewed, bubble back cover, water damage, stains, soil and tanned pages. 452 indexed pages, 8 x 5. 15th edition revised. 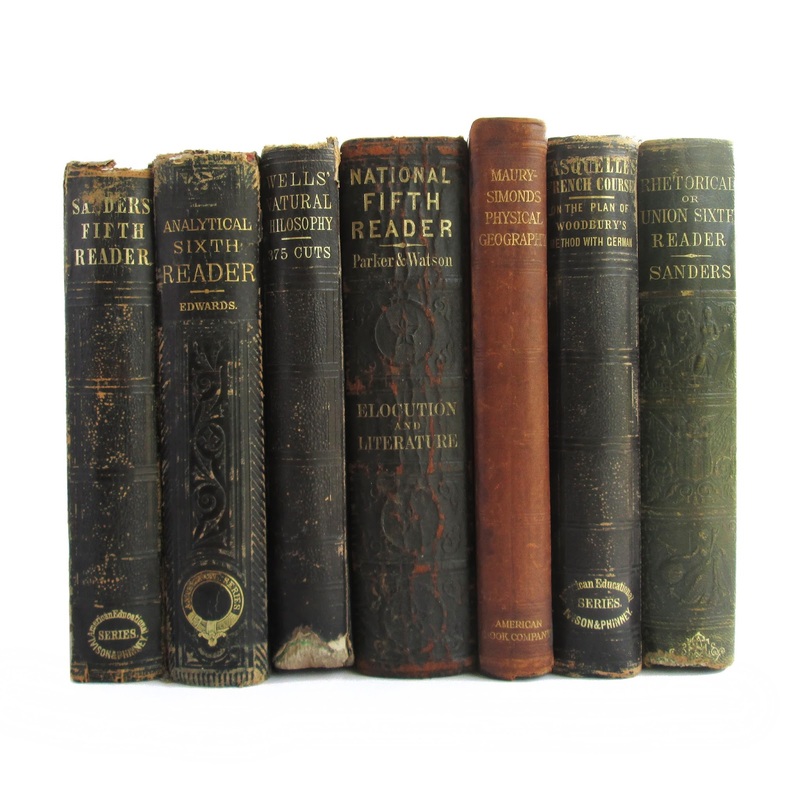 The National Fifth Reader Parker, Richard G.;Watson, J. Madison Barnes & Burr, Publishers Fair 1864 Containing a Treatise on Elocution; Exercises in Reading and Declamation; with Biographical Sketches, and Copious Notes. Owner's name and writing, front endpaper is removed, pages soiled, edges are worn, but hinges are tight. 600 pages. Plane and Solid Geometry Lyman, Elmer A. American Book Company Good 1908 Light wear to spine, generally clean and bright. Half leather binding with green cloth covers. A Practical Introduction to Latin Composition Harkness, Albert American Book Company Poor 1882 Binding loose at title page. Chipping and wear at spine. Pages generally clean. Scuffs and soil to cover. Half leather binding with green cloth covers.